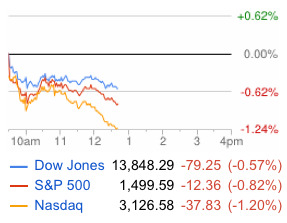 It’s another ugly day in the markets. Stocks are selling off again today, and oil prices are getting walloped.This comes after a jump in initial jobless claims and a horrific plunge in the Philly Fed Index number. Oil prices are down 2.4%. Earlier, Europe posted its latest PMI numbers and they were uglier than expected. France’s economy appears to be crumbling as its PMI number sank to a 47-month low.